South Africa won the toss and elected to bat in the 4th ODI on Friday against India being played at Port Elizabeth. South Africa piled up a score of 266 for the loss of seven wickets thanks to the half centuries by JP Duminy and Hashim Amla. South Africa were cruising along comfortably at 100 for 1 after which they lost four quick wickets, two of which were needless run-outs. 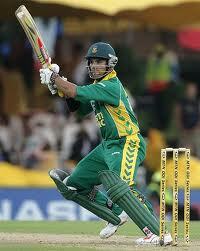 Then came JP Duminy to the crease who, alongwith Botha steadied the SA ship and added 70 runs along with him. Amla took his time to settle down in the early overs, but soon unfurled his full range of strokes to pick up plenty of boundaries. All the three Indian pacers Zahir Khan, Munaf Patel and Ashish Nehra were punished by Amla.